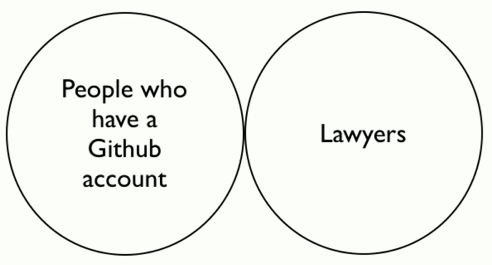 A club full of lawyers who also have GitHub accounts. All you have to do to join is create a pull request with information about your bar membership. Member of the Rhode Island bar (inactive). Member of the California Bar. @tieguy personal account on Twitter. General Counsel at Formlabs Member of the New York Bar. @fros1y personal account on Twitter. @gilbug personal account on Twitter. Member of the Texas Bar. (inactive). Member of the Milan (Italy) Bar. Inactive. @cwmatx personal account on Twitter. Member of the Tennessee Bar. Former Managing Partner of Watershed Legal Services; currently CEO of Eris Industries. Personal Website has all normal coordinates. Member of the Bar in New York and Massachussetts; senior software engineer at Casetext.com. Member of the New York, Massachusetts, Connecticut, Rhode Island, and Louisiana bars. Member of the New York and Massachusetts bars. Member of the Bar in New York and Massachusetts. Member of the Nebraska Bar. I teach Entertainment Law, Legal Ethics, and the Law of Mass Media at the University of Nebraska College of Law. I'm also a novelist and screenwriter and fan of MacVim and plain text tools. Member of the Massachusetts Bar. I am founder and CEO of Casetext. Member of the Massachusetts, New York, Connecticut, District of Columbia and North Carolina state bars. Maintainer of the Model Trademark Guidelines. Founder of LawBox, purveyors of fine legal apps since 2009. Member of the District of Columbia and New York Bars. Member of the Virginia, Florida, and California bars. Member of the California Bar. IP litigator at Computerlaw Group. Member of Madrid (Spain) Bar. IP litigator. IP lecturer. Joined Github on Feb 24, 2009. Legal Project Manager at Honigman Miller Schwartz & Cohn LLP, member of the Michigan Bar, broadly interested in the intersection of legal operations, business development, technology and access to justice, with a particular focus on legal project management, process improvement and legal analytics. Member of the State Bars of Missouri, Illinois, New York, and D.C. Alumnus of Washington University (St. Louis) School of Law. Member of the North Carolina Bar and the Florida Bar (inactive). Solicitor of the Senior Courts in England and Wales (Admitted 2012). Graduate of the University of St. Andrews. Fellow of the Adam Smith Institue and COO of Eris Industries. Member of the State Bar of California (No. 288069). Alumnus of USC Gould School of Law, Class of 2012. Barrister and Solicitor in the Supreme Court of South Australia, Australia. Member of the Massachusetts Bar. Graduate of American University Washington College of Law. Member of the California State Bar. Solicitor and Member of Law Society of Ireland. Law student at Berkeley. Currently a legal intern at EFF; worked previously at the Berkman Center for Internet & Society, the Center for Democracy & Technology, and elsewhere. Law student at Gonzaga University. 2L. Preparing for the patent bar in April. Third-year law student at the University of Wisconsin. Hacker. Law student at Santa Clara University. Privacy advocate. Founder of Fork the Law. Law student at National Taiwan University. Pythonista. FLOSS advocate. Founder of NTU Open Source Community.